Jan Willem ter Steege recently visited the Chinese model city Daqing, located amongst the oil fields of north-east China. Since the start of 2005 Ter Steege has been working for the architecture office A&S in Beijing. Besides some tall office buildings belonging to China Petrol, the Daqing skyline consists of a few clusters of apartment towers and some oil installations. In the evening the tall buildings light up as beacons of apparent activity. Together they only emphasise how far the various districts are from one another. The four main districts  Daqing Chengshi, Ruang Hu Lu, Cheng Feng Zhuang and Xin Cun  are connected to one another by wide roads. Traffic isnt heavy, but taxis and city busses pass regularly as they ferry people from one district to another. The horizon is always visible during a taxi ride. Roads slice across the oil fields, which alternate with areas devoted to agriculture. Although the production city is still clearly in evidence, a remarkable transformation has occurred in many places since the late 1970s: from an efficient model city to a messy and busy commercial centre. The original city structure is scarcely discernible any more, particularly around the city. The original Russian structures from the 1960s can just about be made out behind windows, flags and advertisements. The nodding oil platforms are also scattered here. On the one hand the spacious modernist city plan seems to be flexible enough to accommodate change. On the other hand it should be said that Daqing is simply being overwhelmed by large numbers of migrants from the Chinese countryside. Little by little, the newcomers turn open areas into retail zones using light materials and simple structures, paying little heed in the process to the anti-commercial views of the government. Some 39% of Chinas population currently lives in cities, which compared with 83% in South Korea, for example, is a low percentage. In recent years 144 million people have relocated to the cities, and large numbers will leave the rural farming communities for city life over the coming years. In places like Beijing, the migrants settle in the old abandoned districts and bring them to life. 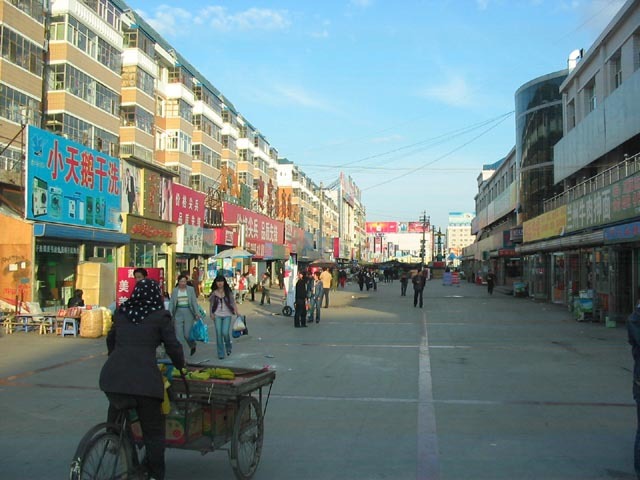 In Daqing the immigrants have exploited the spacious city layout and found their place among the icons of production. The production city without commercial functions provides the rural population in search of economic opportunity with a market opening, literally. Uneducated, they have little chance of joining the productive, organised sections of society. And so they seek their fortune in simple commercial activities such as selling fruit, vegetables and trading clothes. Or later they may open a restaurant. In short, they open up the long-abandoned consumer market in Daqing. In China, where so many people are relocating to the cities, urban models or urban designs are often little more than a starting point. The floods of people arriving from the Chinese countryside are capable  they need little room and can live on little money  of adapting the model step by step. Forty-five years later, what we can learn from Daqing is how and where the vast majority of immigrants find their inevitable place in the (production) cities of China. 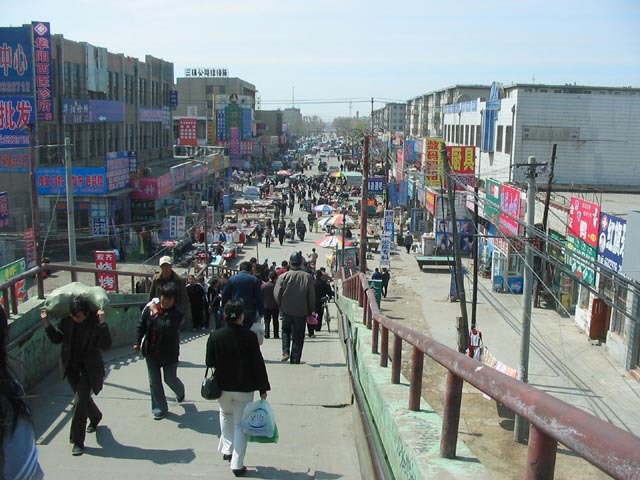 Learning from Daqing in 2006 is learning how the rural population is altering the appearance of Chinese cities. In the best rural tradition the production city had to be self-sufficient. 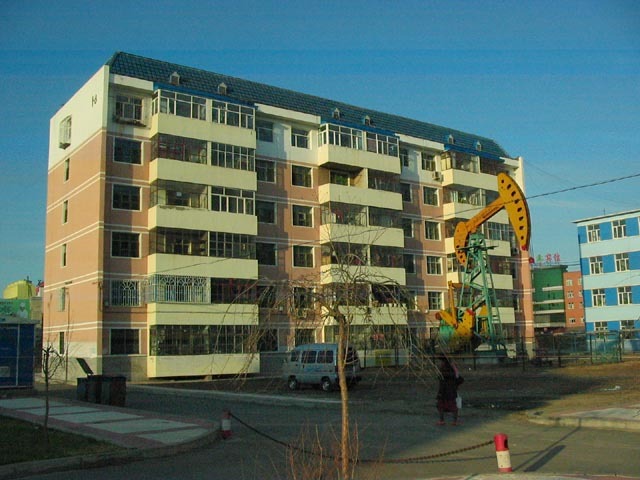 A mother company, located at the heart of the city, was given responsibility for providing not only employment but also food and housing for all residents. The city therefore had to cover an extensive area and be spaciously laid out. Firstly because infrastructure would then remain simple and cheap, and secondly because plenty of space was needed for agriculture within the city limits. But most importantly, the industrial complexes would have space to expand. Oil pumps, gas installations and chimney stacks are visible everywhere in Daqing. 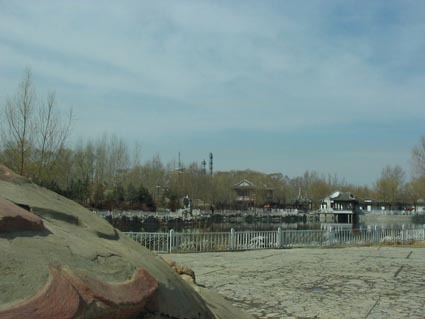 The original ideology of Daqing as a city of production is more in evidence in the JingYuan Park (in the Ruan Hu Lu district). Here the Chinese picturesque tradition is deployed to draw attention to the industrial wonders of the surroundings. At the foot of an artificial hill, from which the Daqing plain can be surveyed, the nearest refinery is visible in the foreground. Winding pathways around the small lake offer alternating views of chimney stacks, a temple, an office belonging to China Petrol and a pagoda. In short: Chinas new monuments in the illustrious company of traditional architectural icons. The train station in Daqing is located in the oldest part of the city. 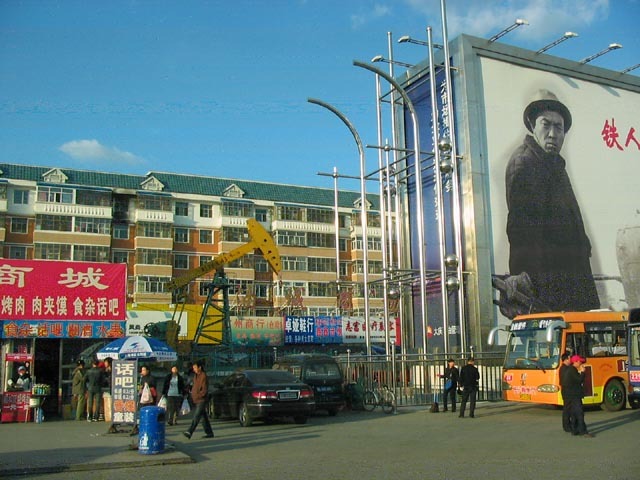 Opposite the station is a black-and-white image of the Iron Man Wang Jinxi, the person who, according to the communist legend, first discovered oil on the Heilongjiang plain. The square in front of the station is named after him. The logic of the oil field seems to have determined the layout of the residential blocks in this district. Oil platforms are scattered everywhere between the apartment blocks built to Russian specifications. Raised oil pipes run along the streets. The parent company in Daqing, China Petrol, is the biggest oil company in Asia. Originally it was responsible for all aspects of daily life, and its still remarkably present in the city. The Daqing website calls the Ruan Hu Lu district the business heart of the city. 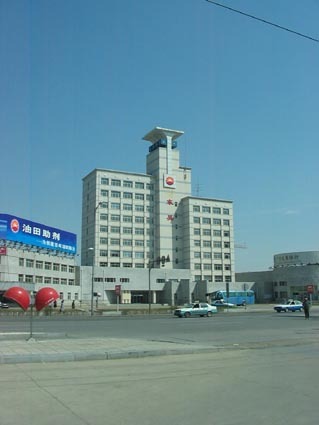 The China Petrol logo adorns many office and factory buildings, even though the names vary from Daqing Property Development Company to Daqing Toothpaste Factory. State-owned businesses such as China Petrol are inefficient precisely because they are involved in so many different industrial tasks at the same time. Thats why the company recently laid off so many workers, just as many other state-owned companies in China have done. With each wave of redundancies, however, the company redirects its interests more towards the market outside Daqing and its original responsibility for the self-sufficient production city declines further. Located right in the international business centre of Daqing, I remember as my taxi races away from the only city district that could even remotely be considered a city centre and speeds towards the Daqing Petroleum Hotel. Small patches of development alternate with distant vistas across the plains of Heilongjiang. Visible on the horizon are the chimney stacks of the oil industry. After checking in, Im accompanied to my hotel room by a member of staff. The long walls are lined with photos of refineries, oil pumps, a spacious roundabout, twenty-floor residential towers, and the offices of China Petrol. These are the monuments of Daqing. Daqing was founded in the early 1960s as the first of a series of industrial cities on a plain in the north-eastern province of Heilongjiang. Daqing literally means great celebration, a name that refers to the discovery of oil in this virgin territory. The oil turned China from an oil importer to an oil exporter overnight. From consumer to producer. The motto Learning from Daqing was coined so that the city could form a model for the entire country. China in the 1950s was totally geared to production. Continuous growth in Chinese production would not only unite the country but also command respect from the rest of the world. To support this one China policy the population was asked to decline from consuming and, instead, to simply produce. The national motto in those days was thus consume less, produce more. At that time the old cities of China were referred to as consuming cities. Maintaining the infrastructure of those densely populated cities was costly. In addition, it was complicated to add industrial complexes to their tight-knit urban fabrics. Deemed to lack purpose, old cities like Beijing, Shanghai and Guangzhou were written off. From then on, only efficient production cities would be founded. The China Contemporary architecture art visual culture event is currently taking place in Rotterdam. See the CC-website for the complete programme.